Food Adventures of a Comfort Cook: Letting go can be so hard to do. Letting go can be so hard to do. 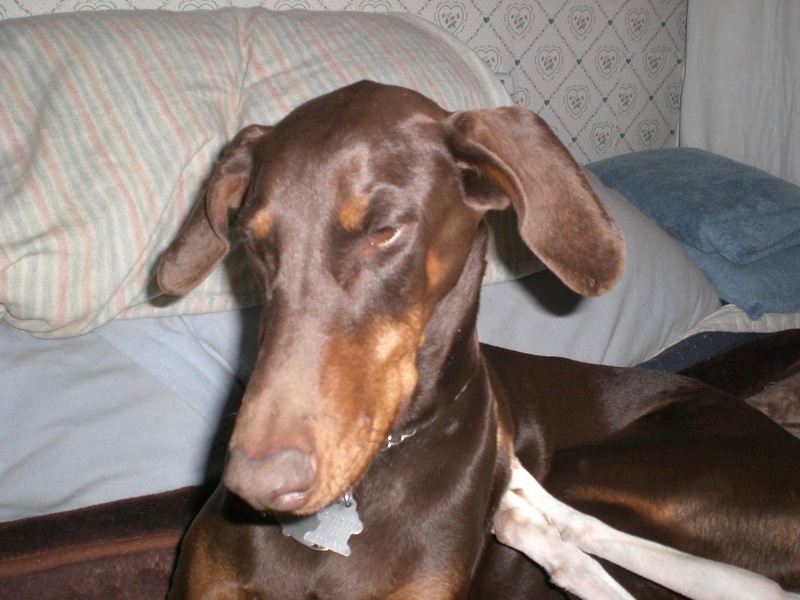 On July 29, 2010, my precious English Doberman, Bonnie, became very ill; we rushed her to the animal hospital at 2am in the morning. She had an illness we had never heard of, “Bloat”, which occurs in big chested dogs. The stomach can twist, causing necrosis, severe pain and eventually death. The vet operated on her, corrected the condition, but it was still a wait and see situation. We saw her on Saturday, she had been eating, and playing outside with the vet assistants, and the vet said she could come home on Monday morning. Monday morning we received a call at 8am; Bonnie had passed away during the night. She was found sitting up in her cage, leaning against the wall, as if waiting for her morning meal. The vet, without doing an autopsy, felt that a blood clot had stopped her heart, so quickly that she didn’t even have time to fall down. My husband handled everything, for all I could do was scream and cry in agony. My baby Bon-Bon was gone, and I wanted to die too. But I had to get my act together, who would take care of Roy, and the other pets, if I was gone? I’m the rock of the family, and wasn’t allowed to crumble. Since then, we have adopted a 5 year old female Doberman, named Jenna, and an adorable male Australian Shepherd mix, named Tippy (who just turned 8 months old). No, neither of them could ever replace my Bon-Bon; but the love they have brought to us makes it feel a bit better. So why am I still feeling so sad? Of all the pets I have ever had, they have always been with family when they have passed on; whether they passed away, at home, while sleeping; or put to sleep at the vet’s due to illness; someone was always with them. Bonnie died alone, in a cold cage at the vet’s; she didn’t have any family members to hold her, tell her how much she was loved and that it would be ok, and relieve any fear she may have been feeling. That is what gets to me the most; Bonnie was alone; and with this writing, I’m hoping to come to closure with that. Heat oil, on high, in a 6 qt stock pot; sauté onions till tender, about 3 minutes. Add beef broth and water; bring to a boil. Lower heat to medium; add in potatoes and carrots. Preheat oven to 350F. In a large bowl, combine beef, turkey, seasoning, bread crumbs and eggs. 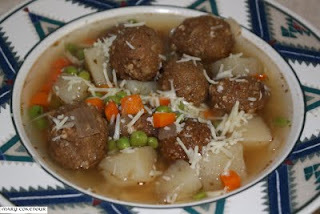 Mix together thoroughly; form meatballs of about a 1 inch diameter; makes about 60 meatballs. Place meatballs on baking sheet and bake for about 10 minutes; just to brown the meat, not cook all the way through. Dab each meatball on a paper towel to remove excess grease before putting into the stock pot. 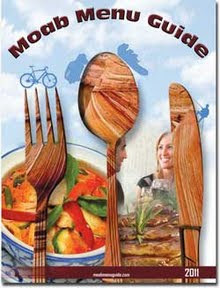 Cook for 30-40 minutes, or until vegetables are very tender. When serving, sprinkle grated cheese on top of soup.